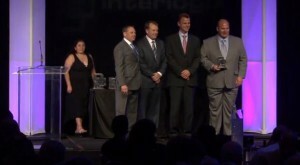 For the second year in a row, Price’s Alarms has been awarded the GE/Interlogix Dealer of the Year award for 2012. The award was announced in May of 2013 at the Interlogix dealer conference in Palm Springs. The Price family was not present at the conference to accept the award as we were all working hard making sure the switch over to our brand new ULC monitoring station went perfectly. Omer Bubica (Territory Manager – Western Canada for Interlogix) accepted the award on our behalf. We are very excited about the future of our business in British Columbia. Our new ULC monitoring station and head office in Victoria BC have been joined together and we are ready for expansion, growth and new technologies as a part of that future. We are proud to be named Dealer of the Year again and look forward to serving BC customers for many more years to come.